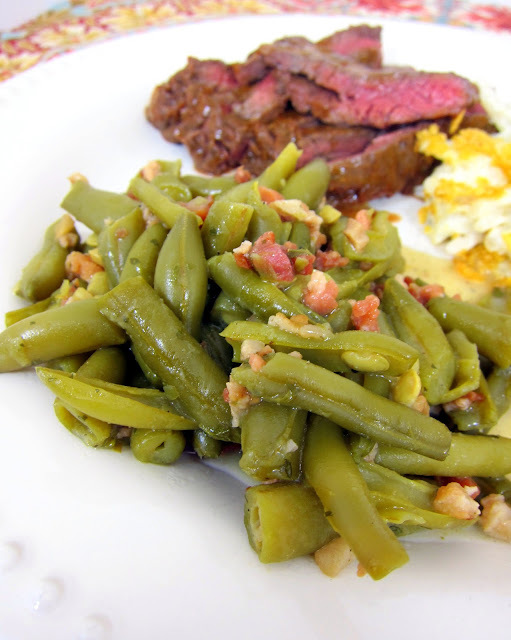 Ranch Style Green Beans Recipe - THE BEST green beans ever! Only 4 ingredients and ready in 20 minutes - you can't beat that! We eat these ALL the time! This recipe was inspired by Plain Chicken reader, Cooking Momma - NOS. She tried out our Crispy Cheddar Chicken Tenders and had some leftover Ranch dressing mix. She used the Ranch dressing in her green beans. Brilliant! I can't believe I haven't done this before. Chicken Legs loves green beans. He would eat them every meal if he could. I gave the recipe a try and it earned 2 thumbs up from Chicken Legs. I've made these at least twice a week for the last few weeks. He really loves them. I love them because it only takes a minute to make. These would make a great addition to your holiday menu! Combine all ingredients in a large sauce pan. Heat over medium heat for 10 minutes. Just made these with dinner tonight and they were a hit. My oldest son only eats green beans with potatoes in them and my youngest only eats them plain. I made them try these before I told them what was in them. I don't think it would have mattered what was in them they liked them so much. Thank you for my new favorite green bean recipe. I made these, and we all thought they were really salty. I think using low-sodium chicken broth, either fresh or frozen green beans, and a little less on the ranch will help with that, so I'll probably try them again at some point. I normally fix mine with chicken broth and bacon. Will have to try the ranch dressing mix as well. Thanks!